00:18:00 Makes 2 servings, 1/2 recipe (150 g) each. Makes 2 servings, 1/2 recipe (150 g) each. 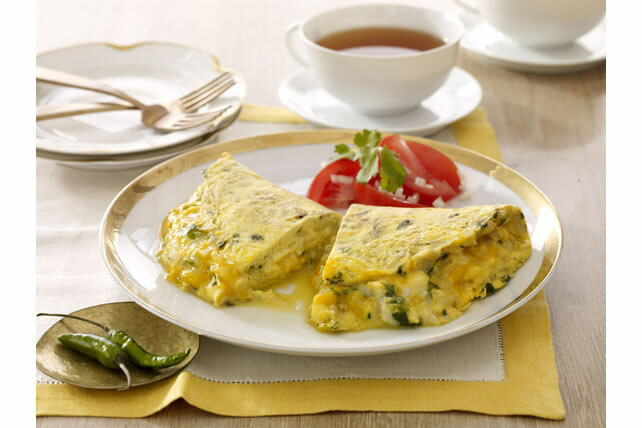 Add a twist to your morning omelette with our Delhi Omelette recipe. Chopped green chilies, coriander and cumin seeds add a touch of Indian flavour to a breakfast staple. Beat eggs and water in medium bowl with whisk until well blended. Stir in cheese. Heat omelette pan or small skillet sprayed with cooking spray on medium-high heat. Add onions, chilies, coriander and cumin seed; cook and stir 2 min. or until onions are crisp-tender. Add egg mixture; cook 3 to 4 min. or until set, lifting edge with spatula and tilting pan to allow uncooked portion to flow underneath to cook. When egg mixture is set but top is still slightly moist, slip spatula underneath omelette, tip skillet to loosen and gently fold omelette in half. Slide or flip omelette onto serving plate; cut in half. A proper pan is important to successful omelette making. Look for an 8-inch diameter shallow pan with a sloping side. The diameter helps to make a thin omelette and the sloping side aids in flipping or sliding the omelette onto the plate. Serving Size Makes 2 servings, 1/2 recipe (150 g) each.